The Best Astrophotography blogs from thousands of top Astrophotography blogs in our index using search and social metrics. Data will be refreshed once a week. Astrophotography newsletter is a comprehensive summary of the day's most important blog posts and news articles from the best Astrophotography websites on the web, and delivered to your email inbox each morning. To subscribe, simply provide us with your email address. San Francisco, CA About Blog Amateur Astrophotography brings to you all the pictures of interstellar objects taken by amateurs. Facebook fans 1,140,866. Twitter followers 502,838. Facebook fans 11,329. Twitter followers 2,769. About Blog Sky & Tel covers the latest night-sky events, astronomy news, astrophotography and observing tips. Also browse our video & podcast guides to tonight's sky. Facebook fans 615,802. Twitter followers 88,532. Los Angeles, CA About Blog Hello and welcome to Lonely Speck! We are Ian Norman and Diana Southern, a couple with a passion for photography and travel. Lonely Speck is the home of our night photography and astrophotography adventures. Facebook fans 6,659. Twitter followers 1,066. About Blog Everything on Astrophotography with a DSLR and astrophotography in general. Facebook fans 2,291. Twitter followers 593. Adelaide, Australia About Blog Obscured by Clouds. The rough and ready blog of a cloud benighted biologist and amateur astronomer. Astroblog will cover my interests in astronomy, biology and Life, the Universe and Everything. Chaos Manor South, Possum Swam About Blog Astronomy author and educator Uncle Rod Mollise Tweeting On Astronomical Subjects..
Indianapolis, IN About Blog I've been photographing the night sky and blogging about it for a few years, but I'm still an astronomical newbie. My approach is to learn by doing, and to try new techniques to get the most out of modest equipment. I love "informed stargazing" and I definitely think of myself as a skywatcher and amateur astrophotographer. Spain About Blog SwagAstro creates fascinating Deep-Sky Objects from our universe, including galaxies, areas of nebulosity and planetary nebulas. Facebook fans 4,642. Twitter followers 2,351. Mountain View, CA About Blog Comprehensive up-to-date news coverage on Astrophotography aggregated from sources all over the world by Google News. Facebook fans n/a. Twitter followers 213,590. About Blog Royce Bair is a magazine photographer that specializes in landscape and in a night photography style called "NightScapes". His unique starscapes help bring astronomy closer to our earth. Madrid About Blog Amateur Astronomy Blog by Roberto Ferrero. Experiences, telescopes, astrophotography, astronomical observation, advice and news of astronomy. Facebook fans 1,198. Twitter followers 1,387. California & American West About Blog Landscape photography and night photography workshops in California and the American West: Yosemite, Death Valley, Bodie, and more. Facebook fans 2,914. Twitter followers 5,796. About Blog Astro Photography Australia was started in early 2004 by Roger Groom in response to frequent requests for his astro photography. Roger is an astro photographer from Western Australia with many years of photography experience. Our mission is to bring you high quality unique Astrophotography of the Southern Hemisphere. Facebook fans 2,626. Twitter followers n/a. About Blog Clear Sky Tonight (CST) is an astronomy community for the rest of us. It is a place to learn about astronomy and discuss astronomy with others who share your interest. About Blog Welcome to my photo blog. My name is Jeff Krueger and I’m a photo hobbyist living in Minnesota. My blog is all about astrophotography. Leawood, Kansas About Blog This website is to help celebrate the beauty of the night skies and our galactic neighbors. Facebook fans 44,522. Twitter followers n/a. Auckland About Blog I am a web and software developer by day and an astrophotograper at night. Because of the nature of my day job, the only times I get to drive out at beautiful locations in on weekends. So, always try to make the best of a weekend. Facebook fans 9,937. Twitter followers 241. About Blog Amateur Planetary & Lunar & Deep Sky Photographer My name is Mike and I have been taking pictures of the night sky for about a year now. I consider myself a novice at both astronomy itself and even more-so as an astrophotographer. Facebook fans 2,429. Twitter followers n/a. Facebook fans 669. Twitter followers 654. Valencia, Spain About Blog Find Images of star clusters, nebulae, galaxies, and the universe around us. About Blog I'm often described by my peers and others as a "world renowned" astrophotographer and night photographer. I'm also a proud husband and father. Facebook fans 30,228. Twitter followers n/a. California, USA About Blog The blog is all about Astrophotography. The fascination of star gazing started already at first years of my childhood. I was looking up at the night sky with my grandfather every summer night, studying constellations, looking at the moon through his binoculars and counting satellites flying by. Breckland About Blog An Astrophotography Blog. Brooklyn New York About Blog Astrophoto from Brooklyn New York, NYC and astrophotography tourism. I like astronomy, astrophotography and nightscape, starscape photography. I like to record the finest details of the Moon, planets, the Sun, the Milky Way and beauty of the night sky. 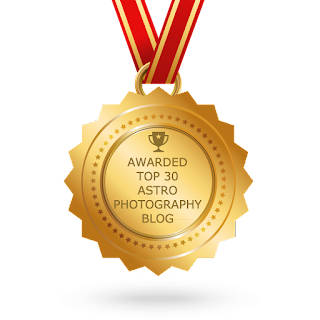 CONGRATULATIONS to every blogger that has made this Top Astrophotography Blogs list! This is the most comprehensive list of best Astrophotography blogs on the internet and I’m honoured to have you as part of this! I personally give you a high-five and want to thank you for your contribution to this world.